Do you know how much I love thrift shopping? This is a fact about me that you need to know. I love searching for old or vintage pieces. I never go to a thrift shop any expectation. I always go to second-hand stores with a free spirit in order to be open minded to any pieces of furniture or clothing. My favorite one around Lausanne is called Emmaus. I mostly find coats in winter, accessories and a lot of dishes. I love crystal and dinner services. I found this lovely oversized cream blazer. It’s from a Zebra store in France, I have no idea, but I love it. I was already dressed up like this and tried that jacket, and I simply needed it. So I got it. I was wearing a pretty white tee though. I customized it recently at the re-opening of the Diesel store in Geneva. We could choose one from the different given hashtags and type something next to it. I decided to add a cute little wording that Forti and I keep telling each other. Lovely gesture, right? Next, I chose a pastel pink heart emoticon and a couple one from the Diesel’s emojis. A simple and interactive creation that everyone highly enjoyed at the opening. And Forti loves it as well, and so do I! Plus, I am wearing some incredible vintage Yves Saint Laurent sunnies from my grand aunt. I wasn’t sure when I received them because these are quite a statement, but I love their colors. These babes are from the seventies, and I am so happy to wear them after my grand aunt. That is what I like about vintage. Clothes and accessories have stories and when it is from your family it is even better to give the object a second life if I may say. Naturally, it is not because I enjoy vintage stuff that I am not into new and modern accessories, such as the beautiful Longchamp clutch bag. Tree colors, pastel pink, black and white, how could it not be mine?! I know, I love love love it! It’s big enough to take everything you need for a party or a day outside. 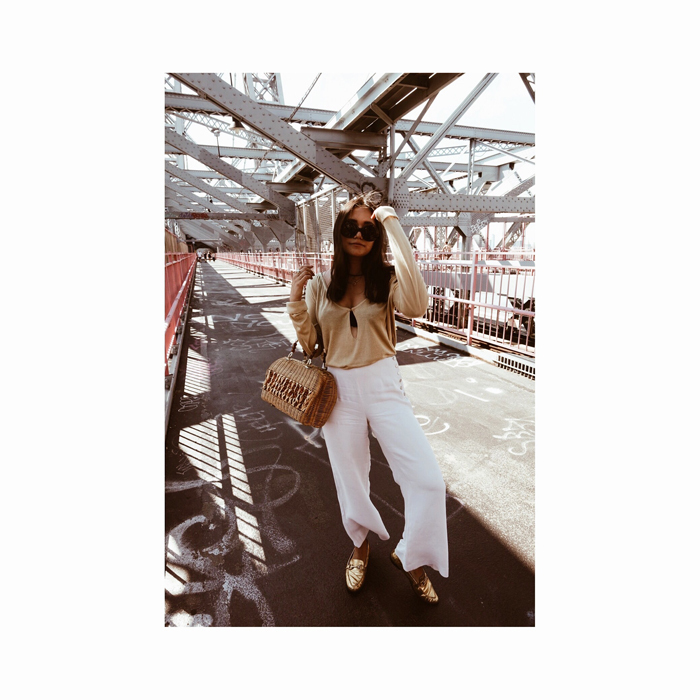 Thrift shopping is just so exciting – I love to discover all these vintage pieces! 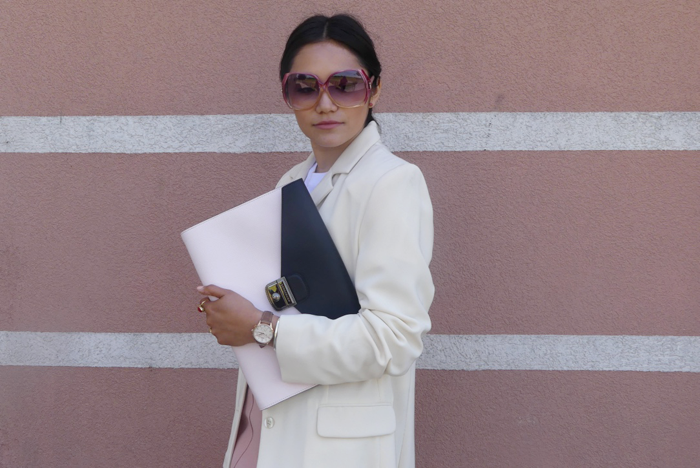 This is such a lovely post dear, I love your pink classy look! Riiiight! Thrift shops are the best!! !